If you have any cake decorating skills and you know a child who loves Handy Manny, the popular character from the Playhouse Disney show, you might be called upon for decorating a cake like Handy Manny. The surprise of a Handy Manny cake will thrill a birthday boy/girl and make the day that much more special. 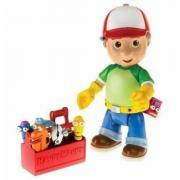 Like other character cake designs, you can customize a Handy Manny cake to your own skill level. Some bakers prefer the challenge of forming the character out of cake and then decorating, while others prefer to bake a basic sheet cake and decorate the character on that. If you don't have a lot of extra time to devote to a cake or you aren't yet confident in your cake decorating skills, baking and decorating Handy Manny's face with buttercream frosting on a basic sheet cake is a good choice. Bake a 9-inch-by-13-inch rectangular sheet cake. Let the cake cool completely, then remove it from the pan, set it on parchment paper, and let it sit in the freezer for about 45 minutes. Take the cake out of the freezer and set it on a serving platter. Brush the top and sides with a pastry brush so that they are free of crumbs. With a flat spatula, cover the cake's top and sides completely with white buttercream icing. Return the cake to the freezer for about 30 minutes. While the cake chills, use gel food coloring to dye three portions of the leftover buttercream peach, brown, and red. When the frosting is firm, take the cake out of the freezer and use a pastry bag and large round tip to spread a circle of peach frosting on the cake. Use the flat spatula to smooth out the frosting to a face shape. If you'd prefer, you can form the face with dots from a star tip. Use a star tip or a medium-sized round tip to pipe brown frosting on the peach face for Manny's hair, eyebrows, and mouth. Use a round tip and red frosting to pipe the shape of a hat on top of Manny's face. Fill in one side of the hat with the red frosting. Outline the middle portion in red and leave it white. Pipe on Manny's eyes with a round tip and white buttercream frosting. Spread the frosting smooth with a flat spatula. For pupils, apply store-bought black buttercream frosting, black fondant circles, or flat black candies. Pipe a small white dot onto the pupil of each eye. Form Manny's tools out of fondant and place them on top of a cake. Coat a regular cake with fondant to resemble a toolbox and place Handy Manny cake toppers on it. Use fondant to form Handy Manny and place him on the cake. If you're pressed for time and can't make a cake, consider purchasing Handy Manny cake toppers, baking a cake from a mix, and decorating with the toppers. Consider decorating a cake like Handy Manny using just Manny's tools or just Manny himself to save time and simplify the process. Rather than trying to form cake into the shape of Manny and then decorate it, think of creative ways to include Manny in a more traditional cake. 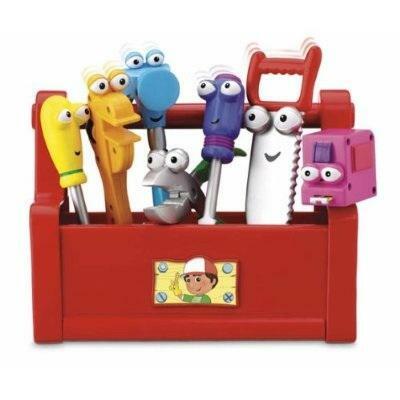 You could place a Manny figurine on top of a round cake or make a border of fondant tools on a square cake. Bake a batch of cupcakes, pipe buttercream frosting on each, and top with a fondant tool. Buy a blank store or bakery made cake and decorate it yourself.